The ProBoom Ultima LP Adjustable Microphone Boom with 12" Fixed Horizontal Arm (12" Vertical Modular Clamp/Bolt Through Riser Assembly) from O.C. White is a modular system designed for table-mounting microphones with stability, easy adjustment, and low visibility for announcers, interviews, and DJs in broadcast, internet television, and radio. 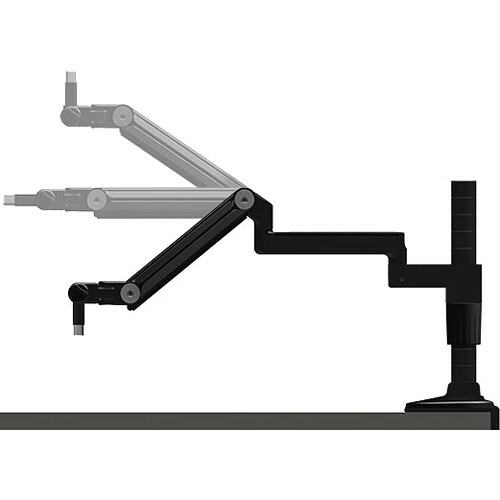 A 12" vertical modular clamp/bolt through riser assembly is included for mounting configurations. The adjustable boom features a 12” fixed horizontal arm and offers a 30” reach. The low-profile, table-hugging design allows on-air talent to perform without facial obstruction. The 6 lb weight rating allows the boom to hold heavy microphones, while the specialized counterbalance design allows effortless adjustment. The integrated wire channeling prevents messy cable runs, and the internal spring contributes to the unit’s stability. Box Dimensions (LxWxH) 26.21 x 9.9 x 7.5"
Guys, on the images I can't see how it fixes on the table. Can you explain to me? Tks.